After I made the Chicken Korma I had leftover apricots. 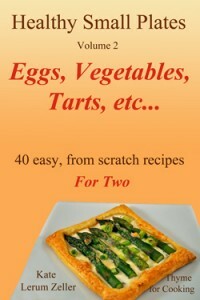 That happens often (always) when one is cooking for two and buys a special ingredient. With something like dried apricots, that leaves two choices: snack on them or make another dish using apricots. Being a frugal femme au foyer I opted for another dish. The Chicken Korma was Indian; this one is Moroccan, based on a recipe from my Moroccan cook book. 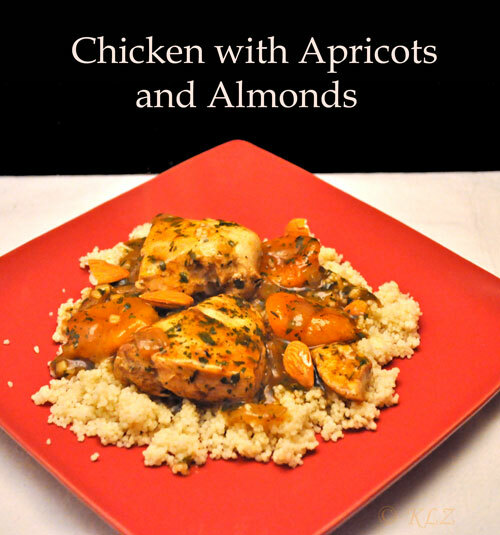 The original recipe used fresh apricots, but we all know I can’t follow a recipe…. Move to the side and add chicken, brown on both sides. Add ginger, cinnamon, paprika and stir-fry briefly. Reduce heat to low add chicken stock, parsley, zaatar, apricots, cover and simmer 10 minutes. Add cornstarch mixture and stir until thickened slightly. Stir in honey and heat through. Divide couscous on to two plates. 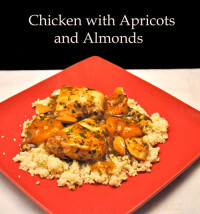 Spoon chicken on couscous, top with almonds and serve. Heat chicken stock to boiling. Pour over couscous, cover and let sit for 10 minutes. They say the road to hell is paved with good intentions….. I put Christmas away today. Actually, it has taken me almost 3 days, but I finished today. I’ve been buying Christmas decorations since I was a child. I’ve made decorations, my mother made decorations, my sister, mon mari’s uncle, my cousin…. They all made, and gave me, decorations. I’ve been given decorations, starting with when I was a child and had a paper route. I’ve bought them whenever we’ve gone to a Christmas market. And, back in the beginning of time. when I was first on my own, I bought the usual boxes of balls and bells and garlands. I decided it was time to do some serious culling. I decided that the decorations that have not seen the Christmas tree or the mantel or any light of day in years would probably not be missed if they were tossed. First, of course, I had to unpack all the odd bits that haven’t been unpacked recently. Then I had to look at everything. Then I had to remember everything. I managed to get rid of a few things. Let’s just say that everything is now packed away very neatly. How do you handle throwing away memories? Or do you keep it all? I say CULL ! If I haven’t used it for a year then out it goes ! Keep it all. Different years I am intrigued by different items. And, who knows which ones will become collector’ s items? Take photos of those you’re sure you’ll never use again. Kate, part of the problem with a big house is too much room to store all the stuff…. I try. Pam, I threw anything that was damaged or just truly mundane…. Jane, that’s a good idea – but I couldn’t part with anything interesting. Next year I’ll try again.